It’s pretty safe to say that the title of this song is its essence. “Converse Girl” features not only snappy lyrics about chucks, but a video in which everyone is wearing them! 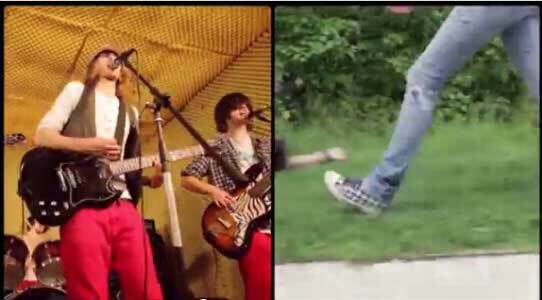 Unfortunately, the footwear in the video is really the only thing worth seeing. 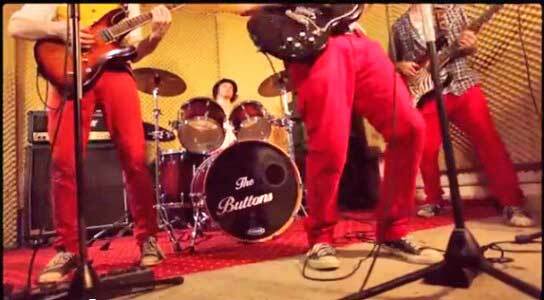 A shot of The Buttons playing in their chucks. When looking at a video, it is always important to remember that varying popularity with music, also means varying budget when it comes to things like tours, merchandise, and, of course, the videos themselves. Nobody expects a small local band to produce a million dollar masterpiece, however, budget should have no effect on creativity. Things like clever storylines and unique props can easily remedy a money-tight situation. The Buttons apparently were not made aware of this. The “Converse girl” heading to The Buttons’ studio. “Converse Girl” is essentially camera cuts back and forth between the band’s Converse clad feet, and the feet of who we are to assume is the ‘Converse Girl’. It follows her along as she travels through town, only to have her, and a dozen or so friends that followed her along the way, rushing into the space The Buttons are performing in. This part is actually mildly entertaining and even has a bit of a redeeming quality, as all the extras do a nice job of making it look like a fun place to be. The “Converse girl” dancing with The Buttons. Overall, “Converse Girl” is a very disappointing video. Sure, it’s great that chucks are such a central theme to the whole thing, but there were loads of missed opportunities to go above and beyond.